In the heart of the Cordovan Jewish quarters, this family hostal has the optimum conditions for you to enjoy your stay in the city. Beside the Córdoba Mosque, Hostal Santa Ana is a building that was constructed from several former houses in the old quarters. It has recently been renovated (2004) and now offers 18 comfortable rooms with the following facilities: Air conditioning, Satellite TV, Bathroom, Welcome pack. Public telephone, Public parking close (12EUR a day) - Fax service, Internet. Had a single room and it was great! Room had attached bathroom and towels:) The location was convenient-could walk over to anything! Staff were very friendly. An amazing hostal. Although you could say, this is small scale boutique hotel. Roof terrace is great but no one was using it because of the heat. 45 degrees. Not a social hostal. Rooms were air conned and super chill. Rooms cleaned every day. What a wonderful stop in Cordoba with a central location and very close to main attractions. Excellent hamam 2 mins away too. Amazing. Thank you to the two very helpful staff who guided us to excellent restaurants. 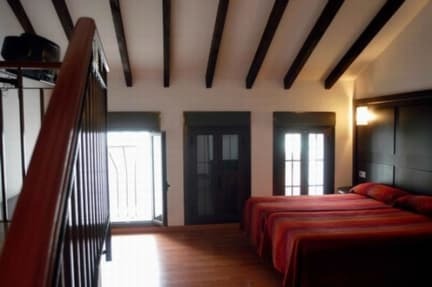 A clean and comfortable lodging in a great location for visiting old town Cordoba. I highly recommend. 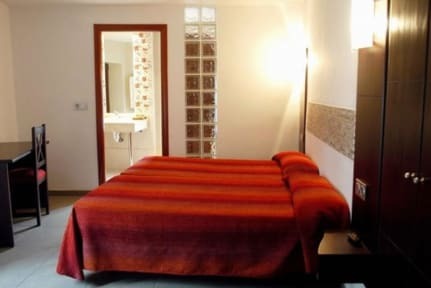 This Hostal is centrally placed on a delightful pedestrianised street just a short walk from the Mesquita/cathedral and the other sights of Cordoba. The reception lady was very helpful and our room 204 was superb and very spacious. The street outside is quits noisy in the early evening but our sleep was not disturbed at all. Breakfasts are not provided but there are several delightful cafes nearby. There is a roof tterrace for relaxation and sunbathing when you are exhausted from sight-seeing. Hostel Santa Ana is not typical hostel actually it is a boutique hotel. I Stayed there for 3 nights in a single room. Everything in the room was intact, bed, pillows and sheets were very clean and ironed. The bathroom was rather big it has a shower stand. The price was rather good. The hotel has a very big terrace with a street view. Location was perfect in the heart of the old city very close to the Cathedral the Mezquita. Tea and coffee and WIFI were free. Definitely a hotel over a hostel. Large clean private rooms with modern clean ensuite. Friendly staff at reception. Not sure if there was a kitchen...it wasn’t pointed out to us on arrival but we were planning to eat out anyway. Not social at all but a very good option if you are wanting a private, quiet night. Great location, 10min walk to the Mezquita with lots of bars and restaurants around. We didn’t use the parking provided but parked 5min walk away at a parking station with no issues. Highly recommended - great location, friendly owners, room rate was fair for a one-star hostal but the safety box in the room didn't work (keys issue) and though I stayed 2 nights the room wasn't made up or towels changed during my stay. Of course, some one-star hotels in my 3 weeks in Spain didn't change the towels so not an issue specific to here. Santa Ana Hostal is a 2 star hotel in Córdoba's beautiful old town. Everything was great apart from the mattress, which was unsprung and way too soft for me, but still not the worst mattress I've slept on. Perfect location near to the bus stop to the train station, friendly 24 hour reception, 24 hour roof terrace, elevator, strong wifi, good shower, daily cleaner, standard check-out time of midday. Good, very cheap cafes nearby for breakfast. Overall, very good value for money. We stayed in a private. The bed was 2 twins pushed together which wasn’t ideal but the bathroom was great. The (few) shared spaces weren’t anything to write home about. It’s has more of a hotel feel to it so don’t expect to meet many fellow travelers. Perfect location, short walking distance to the main attractions in Cordova. This is definitely more of a hotel than a hostel, so if you’re looking to meet people then this isn’t the right place! The rooms are lovely and spacious, and the location is great - close to the sights and within walking distance of many great restaurants.